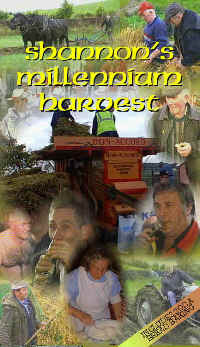 On October Bank Holiday Monday each year, life in Drumnaguilla, Ballybay, Co. Monaghan, Ireland takes a step back in time as Peter and Gene Shannon belt up their Bon-Accord threshing mill to thresh the years harvest. Not even the turn of the new century or the drop rain can stop them. The Bon-Accord is joined in the haggard by the Boyd and Ransomes�?mills where they are fed sheaf after sheaf by friends and neighbours. Out in the field the ploughmen are joined by Big Tom as they plough their way through the muck and the mud. Meanwhile inside in the kitchen the soda bread is baked to perfection over the hearth fire and later brought to the hungry men as they try to beat the rain and the darkness. When all is done and the seed stored away, it’s time to relax with a song, and a dance and maybe a can of beer, if you can get it open !! !